The County Line route from the Blewett SnoPark to Diamond Head and Diamond Point is the most direct, efficient route up this peak. This ascent does not put an uptrack on the common descent routes on the east-facing slopes. Furthermore, if you stick to the ridge, this is one of the safest (most avalanche-free) routes to the summit. In spring, the County Line approach is also recommended if you want to ski the 1500-vertical-foot West Face leading down to Forest Road 9716. Some are fortunate to have experienced the powder skiing to be found in the Wenatchee Mountains on the east aspects of Diamond Head. The area has grown in popularity with ski tourers and snowshoers in recent years. While not a new occurrence, more use has resulted in more people climbing directly up the main avalanche path on the east aspect of Diamond Head beneath Diamond Point. Aside from having frozen zigzag uptracks beneath the powder at times, it astounds me that folks travel or even sit and have lunch beneath the steep avalanche starting zones above them. 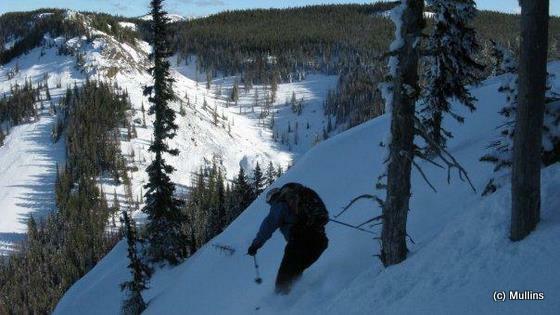 Avalanches sweep that entire 900 vertical feet of open slope every year. Last year I saw tracks of skiers who had skied away before avalanche debris covered their ski tracks 900 vertical feet below the starting zone! Those of us who have worked as ski patrollers and who have hucked bombs or ski cut at a ski area to release avalanches have been taught the concept of getting on top of the hazard and jumping on it. For Diamond Head, ski cutting the slide-prone East Face from the top is far safer than climbing up the same slope. 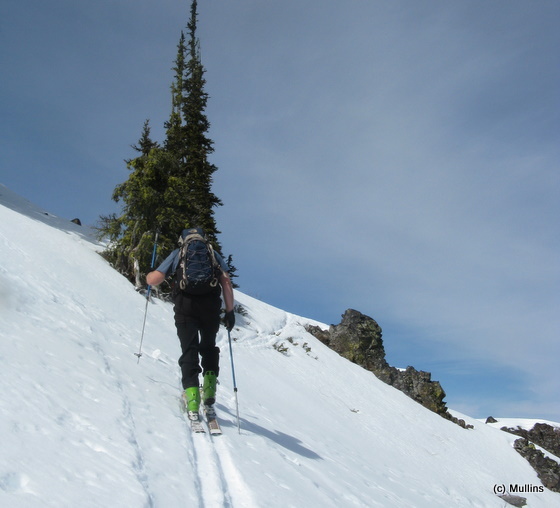 When above the potential avalanche starting zone, it is also safer to dig snow pits, do Rutschblock tests, etc., before deciding to ski down the slope. And from the top, if you don’t like the results of what you’re finding, you can retreat to a safer route without having exposed yourself. Rather than walking up an avalanche path, the ridge that the county line follows keeps you on a safe edge. If you do ski any of the different east-facing lines off Diamond Head (elevation 5915’), you can return to the Blewett Pass Sno Park via the XC 15 Trail, which is in the Tronsen Non-Motorized Area. The XC 15 Trail from Blewett Sno Park to Haney Meadow, dates back to about 1963 and traverses beneath the open basalt-rock slopes forming the eastern aspect of Diamond Head. This trail is of great value to ski tourers wanting to enjoy the excellent powder slopes in the area. The descent from Diamond Point (5840′), accessed from the County Line approach, ends on the XC 15 Trail at an elevation of about 4950′. At the XC 15 Trail, one may choose to turn left and return to the Sno Park or to turn right and climb through the woods to access more terrain in the Tronsen Non-Motorized Area. Photo: Skiing the West Face of Diamond Head. Length. The circuit from Blewett Pass to the top of Diamond Head with a return via the XC 15 Trail is roughly 5 miles long. 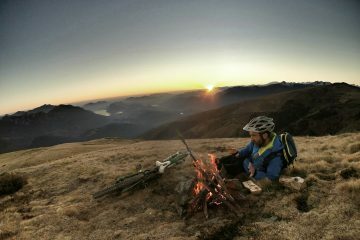 Elevation Gain: 1,800 vertical feet. Access. From the Big Y Junction where Highway 2 and Highway 97 intersect, follow Highway 97 south for 21 miles to Blewett Pass. Park in the Sno Park area. A Sno Park permit is required. From the Blewett Sno Park (4100’), travel up the groomed road (Road 9716) for 100 yards. At the corner, leave the road and head straight up the slope. Up the slope to climber’s left of the gully takes one through the summer parking for the Discovery Trailhead. 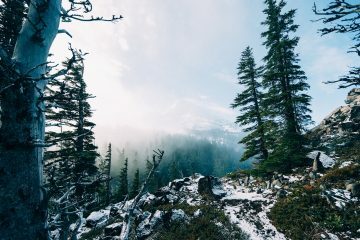 If you head to the right side of the gully you’ll intersect a well-used winter trail which may be followed while keeping in mind the general direction of travel to Diamond Point. From Forest Road 9716 to the south of the Discovery Trail is the XC 15 Trailhead, with several signs indicating destinations and mileage. Follow the XC 15 trail for 0.5 miles. At a crest is the intersection with XC 141 Trail. At that point do not descend, travel perhaps 100 feet south on the XC 141 trail and then go up the obvious open slope divide, the County Line. From here the rule of travel is to follow the open route up County Line to Diamond Point (5840’). 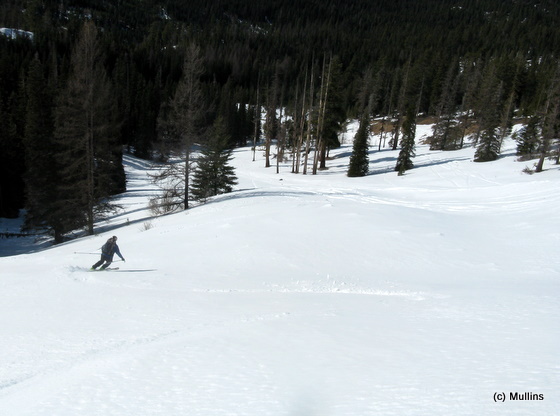 If you determine the snow is safe, you can ski from Diamond Point to the northeast and descend the large open slopes that end at the XC15 Trail. Or if the snow coverage is good, you can continue up to the crest of Diamond Head (5915’) to ski the West Face. 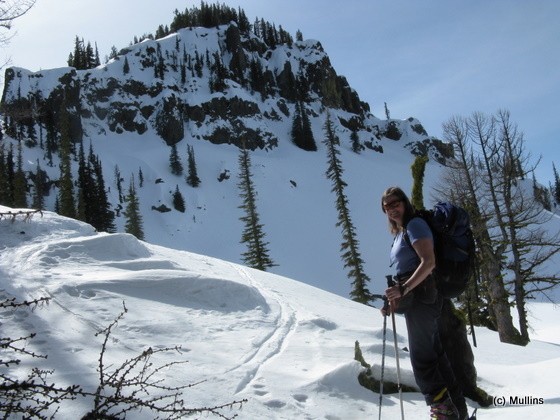 I have had the best skiing on the West Face during spring corn snow conditions. Map. 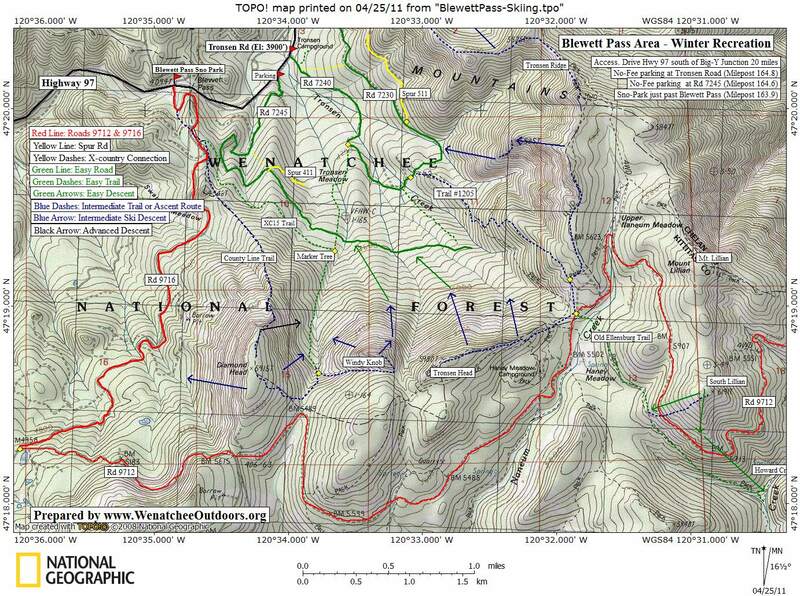 See our topo map below of this route and other routes in the area. Avalanche Hazard. Be aware as you travel the XC 15 Trail that the open slopes above you do avalanche. Even the open slopes through the rockslide area on Road 9712 southwest of Diamond Head exposes you to regularly occurring avalanche hazard and human-triggered avalanching or active natural avalanching at times. If you don’t know how to assess the hazard and how to travel safely through avalanche terrain, you shouldn’t be exposing yourself to the danger. It doesn’t matter at all if you have a shovel and a transceiver, if you don’t get it right every time you travel through avalanche terrain, you’re eventually likely to kill yourself. Photo: Near the top of the County Line approach.